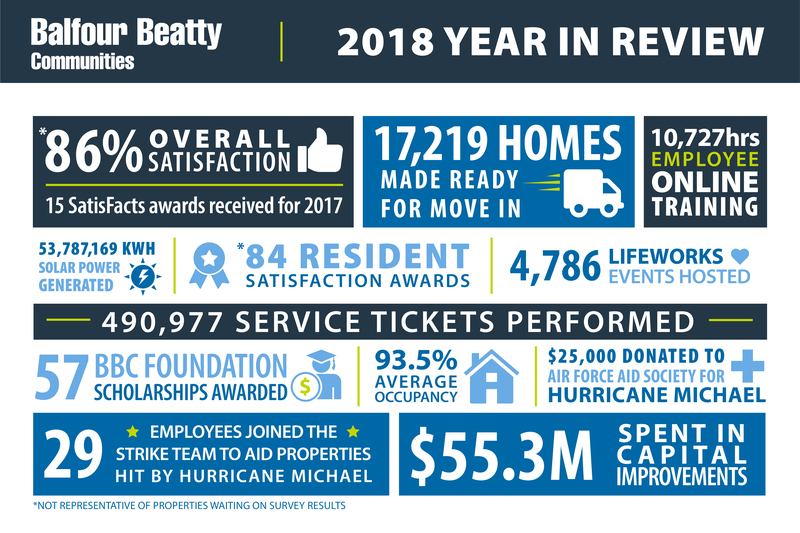 Balfour Beatty Communities noted several key achievements in its military housing portfolio during 2018, including an 86 percent overall resident satisfaction rating, $55.3 million invested in capital improvements, and more than 17,000 homes made ready for move-in. "As we close our 15th year as a partner in the Military Housing Privatization Initiative, it seemed appropriate to look at the breadth and scope of what our team has achieved,” said Anne-Marie Niklaus, SVP of military housing for Balfour Beatty Communities. “We have faced significant hurdles and complex infrastructure challenges head-on, putting in place innovative, long-term solutions that have resulted in military housing communities that offer an enhanced quality of living, while performing more efficiently." Balfour Beatty Communities is a nationally recognized leader in the Department of Defense’s Military Housing Privatization Initiative (MHPI). As one of the founding partners in MPHI and a premier military housing developer, Balfour Beatty Communities is responsible for more than 130,000 residents in more than 43,000 homes across its military portfolio. In 2018, Balfour Beatty Communities executed military housing capital improvement projects valued at more than $55 million, including the construction of new homes, ongoing renovations and improvements to existing homes, development of new community amenities, and upgrades to overall community infrastructure like roads and sidewalks. These most recent achievements demonstrate Balfour Beatty Communities’ ongoing commitment to delivering an exceptional living experience for all of its residents, military families first and foremost. Through ambitious company-wide training efforts, initiatives targeted at efficiencies, cost savings and sustainability, as well as considerable investment in infrastructure and capital projects, Balfour Beatty Communities is very proud to continue to fulfill its mission as one of the leaders in MPHI.